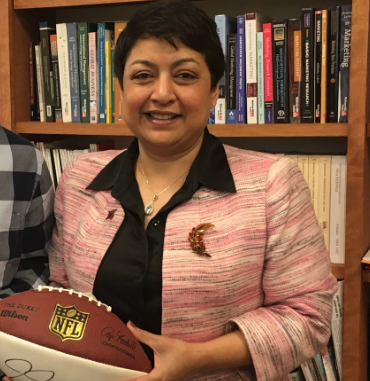 Business School Dean Dr. Rama Yelkur keeps football memorabilia in her office, in line with her research about the Super Bowl. Just in time for the biggest sports event of the year, this latest in our our Get to Know series — which explores unknown yet interesting aspects of Fisher community members’ lives — features a look at Business School Dean Rama Yelkur, her passion for football and her research agenda around Super Bowl advertising. During the Super Bowl each year, football fans across the world root on not only their favorite team but also root for their favorite commercials to win the ratings. No one is more of an expert on Super Bowl advertising than Dr. Rama Yelkur, the dean of the St John Fisher College School of Business. With over 20 years of research on the various factors that each and every business airing a commercial during the “big game” this year will consider when paying the average $5.3 million for airtime this year, Dr. Yelkur has seen it all. Dr. Yelkur began her research on Super Bowl advertisements when she was a professor of marketing at the University of Wisconsin at Eau Claire years ago. “It was a cold winter day, just like today, when I needed an assignment to give my promotions class that would be an exciting and relevant project. So, I told the class to watch the Super Bowl and look at the different appeals the commercials have,” she recalled. A simple assignment turned into a passion that Dr. Yelkur continued to build on. For years, she has conducted research with individual students, groups of students and other colleagues where she and her research partners look into the various factors that drive advertisement likability. She’s had articles on the topic published in scholarly journals such as the Journal of Marketing Communications and Journal of Marketing Development and Competitiveness. Without a marketing background, it might be a challenge for the general audience to notice the different factors that drive Super Bowl commercials and their likability, but this is a challenge that Dr. Yelkur had set out to tackle. After years of research, Yelkur and colleagues have found that the commercials that are remembered and talked about at the water cooler the next morning are commercials that are driven by humor, animals, emotion and kids. “I like humor, so Kia’s Melissa McCarthy commercial I liked, I also liked the Morgan Freeman’s Mountain Dew commercial. Humor, animal surprise commercials, anything that makes me laugh,” Yelkur said regarding her favorite commercials and what drives them. The Super Bowl is not just an American event;, many other countries around the world also tune in to the most watched sporting event in the United States. Despite the rave over the commercials in America, the excitement is not as high because the commercials are not the same. But, that attention to detail and liability factors is still prevalent. “They advertise different commercials across the world, and they do not pay as much, but more and more I am receiving phone calls about the commercials internationally,” stated Yelkur. St. John Fisher College got involved in the hunt to see which commercials were the most memorable in the 2018 when students went around campus to different classrooms conducting a survey to see which commercials Fisher students liked the most. Dr. Yelkur hopes for a big win this year, but not from either of the two competing teams. She hopes for an overall win for the advertisers in the 2019 Super Bowl. Tune in Sunday Feb. 3 at 6:30 p.m. to see the Los Angeles Rams take on the New England Patriots in Super Bowl LIII to see if that’s the case.